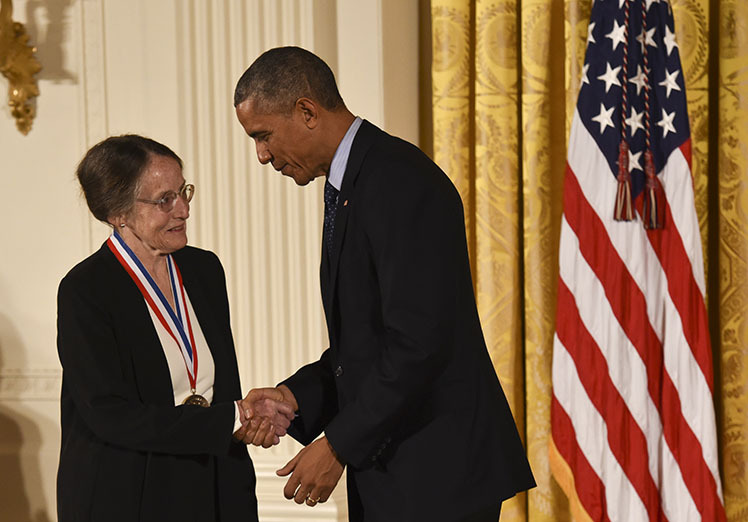 President Barack Obama presented the National Medal of Technology and Innovation to Carnegie Mellon University’s Mary Shaw, citing her innovations to computer science education, during a White House ceremony Nov. 20. Shaw, who earned her Ph.D. in computer science at CMU, is the Alan J. Perlis University Professor of Computer Science in the Institute for Software Research. She was honored along with 18 other recipients of the National Medal of Science and the National Medal of Technology and Innovation. The President recounted how Shaw, as a young college student, was greeted in a busy engineering hall as she searched for the computer lab. “She says, ‘When I first showed up they handed me a user manual and told me to go read it and, silly me, I thought it was an invitation, so I did read it – and I came back,’” he said, drawing chuckles from the audience in the East Room. Shaw’s award citation reads: For pioneering leadership in the development of innovative curricula in Computer Science. Shaw is a faculty member in the Institute for Software Research, the Computer Science Department and the Human-Computer Interaction Institute. She has developed computer science curricula from the introductory to the doctoral level, including graduate programs targeted at software professionals. From 1992 to 1999, she served as the Associate Dean for Professional Education and in 1997-98 was a Fellow of the Center for Innovation in Learning. She was the first recipient of the Distinguished Educator Award presented by the IEEE Computer Society’s Technical Council on Software Engineering, and the first recipient of the Conference on Software Engineering Education and Training’s Nancy Mead Award for Excellence in Software Engineering Education. Shaw, a faculty member since 1971, also is a leader in software engineering research. Her work on software architecture — the large-scale structure of software systems — helped establish it as a recognized discipline. She has served as chief scientist of Carnegie Mellon’s Software Engineering Institute. Computer scientist and Turing Laureate Charles W. Bachman; Edith M. Flanigen of Honeywell; Eli Harari of SanDisk Corp.; Thomas J. Fogarty, Fogarty Institute for Innovation; Arthur Levinson, Calico Life Sciences; Cherry A. Murray, Harvard University School of Engineering and Applied Sciences; and Douglas Lowy and John Schiller of the National Cancer Institute, National Institutes of Health. Bruce Alberts, University of California, San Francisco; Robert Axelrod, University of Michigan; May Berenbaum, University of Illinois at Urbana-Champaign; David Blackwell (posthumous), University of California, Berkeley; Alexandre J. Chorin, UC Berkeley; Thomas Kailath, Stanford University; Judith P. Klinman, UC Berkeley; Jerrold Meinwald, Cornell University; Burton Richter, SLAC National Accelerator Laboratory and Stanford University; and Sean C. Solomon, Columbia University. Previous winners of the National Medal of Technology from CMU include Charles Geschke, the co-founder of Adobe Systems and a 1973 Ph.D. graduate in computer science; the late Watts Humphrey, a fellow of CMU’s Software Engineering Institute; the late alumna Stephanie Kwolek, the inventor of Kevlar who earned her bachelor’s degree in chemistry in 1946; and Gordon Bell, a renowned computer designer at Digital Equipment Corp. and Microsoft and a former computer science faculty member.